Campaigns have gone digital, relying on social media platforms and text messages to reach voters – but yard signs are still the promotion of choice for some voters. With the November midterm election less than a month away, signs have been popping up in yards and lots across the state touting various candidates. O’Rourke’s black and white signs are a stark contrast to the typical red, white and blue political sign. Diaz has one of the black and white “BETO” signs that have sprouted in lawns across Texas. Beto O’Rourke, a Democrat, is challenging Republican incumbent Ted Cruz for his U.S. Senate seat. 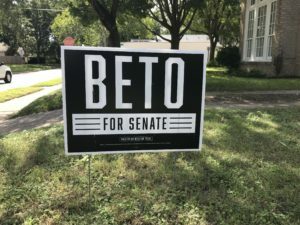 A campaign spokesman said it has not tracked the number of BETO signs it has sold or given away, but it seems as if O’Rouke’s black and white signs dominate lawns across Texas, far outnumbering his competitor. 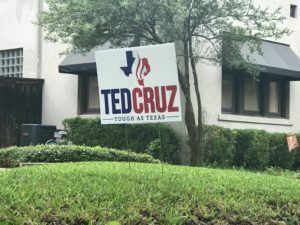 The Star-Telegram reported that the Cruz campaign has distributed 10,000 signs so far and ordered another 25,000 in an attempt to bridge the sign disparity. But the Cruz campaign said in a statement its primary focus is voter contact. That hasn’t stopped Cruz signs from appearing across the Lone Star State. “I plan to vote for Ted Cruz in November — [but I] never looked for his sign until hundreds started popping up for Beto,” said Lauren Dooley, a senior political science major and officer with the College Republicans. The Princeton Review ranked TCU students as the 19th most conservative in the nation last year, but Dooley said she was worried her sign might rankle some of her neighbors and friends. Nevertheless, she posted it. Dooley and Diaz said if their signs were stolen or destroyed they wouldn’t hesitate to replace them. “I would keep replacing it with a new one until they realized destroying it won’t keep me from voting for who I want,” said Dooley.